For fans of Mary Balogh and Christi Caldwell comes a new tale of love and adventure... from the high seas to the ballrooms of London! Twelve years ago, Lady Silcox fled England with her young daughter Violet to spare her the life she herself had been forced into: an arranged marriage to an older man. 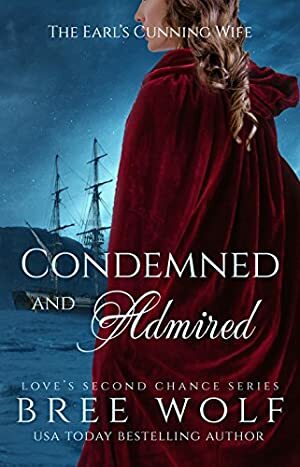 Today, VIOLET WINTERS is a grown woman sailing the seas on a French privateer, dreaming of commandeering a ship of her own. However, when she stumbles upon a piece to her past, Violet feels honour-bound to return to England. And fortune smiles on her, delivering an English lord into Violet's hands... as well as her heart. OLIVER CORNELL, EARL OF CULLINGWOOD, is trapped in a life he abhors. Not seen as a son, but merely an heir, he dreams of sailing the seas, the epitome of freedom. By sheer happenstance, Oliver ends up on a merchant vessel, which is promptly boarded by a French privateer. On board, Oliver meets the captain's daughter, a woman unlike any other he has ever met. Utterly fascinated by the adventurous gleam in her eyes, he does not hesitate to offer his assistance when Violet finds herself in need of a guide to London's upper society. Reveling in his first taste of adventure, Oliver poses as her husband... only to realise before long that posing as her husband will not be good enough. Can a privateer's daughter and a marquess's son ever have a happily-ever-after? Or is their love doomed to fail? Log In to track Bree Wolf on eReaderIQ. to be notified each time the price drops on any book by Bree Wolf. to stop tracking Bree Wolf. We started tracking this book on May 19, 2018. The price of this book has changed 5 times in the past 336 days. The lowest price to date was $0.99 last reached on April 2, 2019. The highest price to date was $3.99 last reached on April 10, 2019.